OK here is some of the tools I use. The "collection" platform I use is symbaloo.com which I find very useful to collect programs, apps & tools. Very easy to use and when its set as your home page - everything is right there. I would also suggest checking out the gallery pages on symbaloo. search for the one titled "tech for teachers"
I have created a OneNote binder will tech resources. This is a page currently written to be shared with teachers. We have a large group of teachers that we will be training this summer to be more proficient with technology. Many are at tier 1 and a few are at tier 2. As I add to this notebook, I hope to have lots of resources categorized to make their use easy for teachers to select and access. Good reminders for myself as well. This is a handy list of classroom and project management tools as well as tech web sites they can explore. I'll use this with my seniors as I discuss what is out there to help them as they transition from high school. I will be adding to this over the summer. Here is the website I created for my upcoming American History class. I have downloaded the A More Perfect Union unit from the www.Choices.edu history curriculum. Part of my rankings will be journeyman - students will have to journey outside their history textbook to find additional information. This website offers multiple sites for them to research. The page is intended for use by teachers and myself. 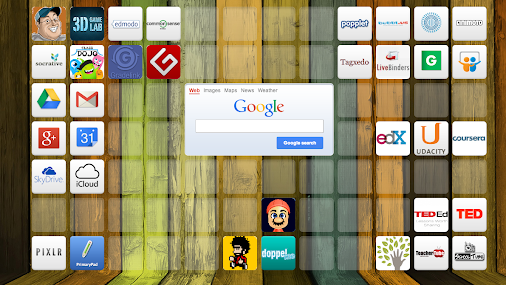 I decided to use symbaloo to collect my tools. I have a spreadsheet too, but this is prettier. These are all for my 6,7,8th graders. These are all tools that we use in class plus a few new ones and some reminders for me. I like this because I can embed it on on other pages so it can be accessible all over the internet. Trying out a live binder for our 1:1 integration. Still early, but with Google Docs you'll always get to see the updated version as I continue to expand. I really made this list of things I want to use next year.